Collected Lies and Love Poems, selects from a sequence of sonnets written from 2008-2015. Reed, the author of five previous books (three novels and two "stunts") lends his voice and eclectic abilities to this singular work, which, in addition to being a book of sonnets, is part love letter, part literary ode, and part delusion. Evolving the classical sonnet, a form which still captures our spirits, Reed summons our contemporary yearning: sugar sweet to splash of acid. "Come to me," writes Reed in sonnet #6, "like tomorrow to a child." Sonnet #41, in contrast, offers the lyrical confession, "All I want to do is stab people." With his plaintive lines, Reed gives expression to the inner ghost of the Twenty-First Century; sonnet #65, a valentine, wonders "Momma, are there other wooden children?" Free Boat spans 54+ sonnets, and that's a lot of sonnets, but Reed's stylistic ease guides his audience through an experience more akin to reading a photo essay. Indeed, of the 23 images in Free Boat, 9 are photographs by the author. Rhapsody, serenade, picaresque, Free Boat would be as comfortably tabled with Nadja by Andre Breton, as it would be with The Dream Songs by John Berryman, Delta of Venus by Anais Nin, or Under the Net by Iris Murdoch. This may be what it takes to get people to read poetry. John Reed has been writing hard-to-classify books for over a decade, to great acclaim and sometimes greater notoriety. John Reed exploded my concept of a sonnet. There’s something dangerous here … As a married person, I find myself very affected by the thorny feelings expressed in these sonnets. I’m asking: Is this sonnet about an adulterous husband? Or an adulterous wife? Or neither partner is adulterous, and that’s the agony. Do they wish they were adulterous, but they’re just too scared? These blurry betrayals frighten me. 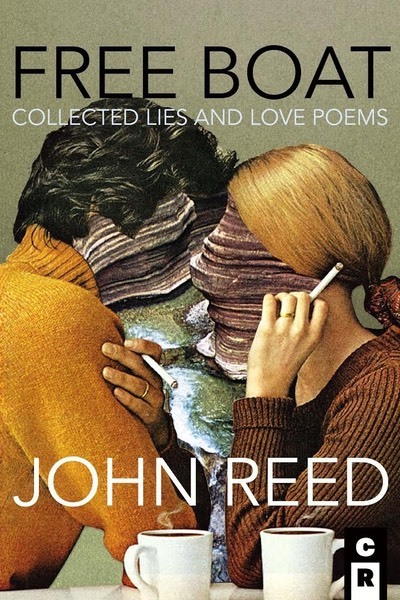 John Reed’s wonderful new book Free Boat: Collected Lies and Love Poems gives me that … love and quirkiness that I crave, while being a more interesting and fulfilling artistic experience. … Love poems with built in lies and upside down truths, in which you can find a story of your own— and how you think about relationships.